Are you the type of person who's always seeking the spirit of adventure? If so, then you might like to know about the following five attractions maintained by the Imperial War Museum. Initially established in 1917, while the First World War was still being fought, the IWM has continued to collect and tell the stories of those impacted by war and conflict. They've been doing this for over 100 years now, so as you can most probably guess, they are rather good at doing it. So good in fact, that they would love for as many people to take in the knowledge they've managed to accumulate over the years. For instance, by jumping on-board HMS Belfast, people can discover how a group of children were rescued from Shanghai and then thrown a party by the ships crew, circa 1945. Whereas if you enter the actual museum itself, based in the heart of London, you can sit down and read the letters written by a 10 year old evacuee that's on display within the exhibition, Family in Wartime. There are also unexpected and surprising facts for you to uncover across all five branches, picking up special free centenary leaflets along the way, but of course, only as long as stocks last. Now for a quick run down on what the IWM has on offer, here, please check this out. HMS Belfast, a Second World War Navy Ship that served during D-Day, is the largest object in the IWM’s collection. However, did you know that she once played host for a children’s party? On the 1st of October, 1945, HMS Belfast docked in Shanghai and welcomed former internees on-board, following their liberation from Japanese-run camps. Hunger had been rife in the camps, so young internees were treated to delicious jellies, cake, and chocolate, all things denied to them during their captivity. The ship’s crew also constructed slides and swings in order to welcome their young guests. Admission: £16 for Adults; £12.80 for Concessions (Senior, Student, and Disabled); £8 for Children (Aged between 5 to 16); Children under 5 enter for free; and Family tickets are available (Special rates for groups of ten plus). After the sinking of the German light cruiser, SMS Dresden, on the 14th of March, 1915, an unexpected survivor was saved from the seas by a sailor on HMS Glasgow, namely, ‘Tirpitz’ the pig. The frightened Tirpitz, who was seen swimming in the waters off the Juan Fernandez Islands in the South Pacific, nearly drowned his rescuer, but was safely brought on-board where he served as the ships mascot for approximately a year. Visitors can find Tirpitz in the First World War Galleries on level 0 of the museum. Lancasters, Spitfires, Concordes, and Vulcans are just some of the historic aircraft's that you can see close up at IWM Duxford. People can see actual restoration in progress and meet the skilled engineers who make these remarkable vehicle's fly again! So look out for a newly restored aircraft flying overhead while your child can let off steam in the museum’s green spaces or the exciting playground, Activity Zone. Admission: £18 for Adults; £14.40 for Concessions (Senior, Student, and Disabled); £9 for Children (Aged between 5 to 16); Children under 5 enter for free; and Family tickets are available (Special rates for groups of ten plus). At IWM North, visitors can find out about the experiences of ten thousand Jewish children during the Second World War who were sent to Britain by parents desperate to protect them from the growing Nazi threat. Shocked by the events that played out in Kristallnacht (November, 1938), the British government approved a rescue effort that brought refugee children to Britain upon the Kindertransport (also known by the name, 'Children’s Transport'). One of these children was Arnold Urbach, who carried a suitcase with him on his journey from Germany. You can see Arnold’s suitcase in Silo 1: Experience of War. The lights of Winston Churchill’s underground war time Cabinet Complex were switched off for the first time in six years on the 14th of August, 1945, and many of the rooms were left completely untouched until IWM took over the site in the early 1980s. While preparing the Map Room for public opening, an envelope baring Wing Commander John Heagerty’s name was discovered in a draw. Inside this envelope, hidden since Second World War operations took place, were three sugar cubes, a treat well-worth hiding given that sugar was rationed. See these sugar cubes exactly where they were left in the Map Room, and also pop into the Churchill Museum, where children can see Churchill’s very own onesie! Admission: £19 for Adults; £15.20 for Concessions (Senior, Student, and Disabled); £9.50 for Children (Aged between 5 to 16); Children under 5 enter for free; and Family tickets are available (Special rates for groups of ten plus). 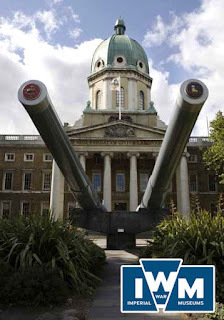 Now for any more information please don't hesitate to pop on over to the official Imperial War Museum website, facebook, and twitter pages. Trust me, you won't be disappointed that you did.